Gas Street Basin & Brindley place is in the heart of Birmingham's canal network, and has been redeveloped into a unique experience where traditional narrow boats moor up next to cosmopolitan cafes and bars. The surrounding area is a vibrant arts & entertainment area and there are many shopping options within a short walk. On your doorstep will be every type of cuisine you can think of, from Caribbean to Nepalese, from Thai to Italian. Also clubs and bars, Theatres, Comedy and live entertainment and Cinemas. If you wish to start your holiday off with an adventure, how about walking to the Snow Dome which is only about 10 minutes from the marina. All weather skiing and snowboarding centre with kit rental, an ice rink, swimming pool and gym. It is open until late every night. Step back through 900 years of history with a visit to Tamworth Castle. Uncover the secrets held within the chambers and hallways of this unique building and get a real sense of how the Saxons, Normans, Tudors and Victorians lived. Once back on the boat turn right out of the marina and cruise westwards and immediately you encounter Glascote Locks, but the trainer will show you how to use the locks, so don't worry. At the Fazeley Junction turn left along the Birmingham and Fazeley canal, soon you will reach Drayton Manor Theme Park - The UK's best family theme park with kids rides, family fun, zoo, and thrill rides. 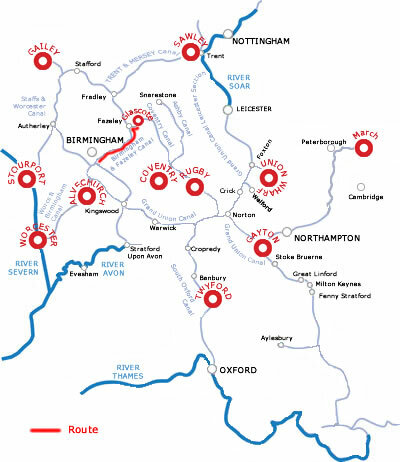 The route takes you through quiet countryside until you reach Birmingham. The Gothic style footbridge at Drayton Bassett is worth a photo, it has twin battlemented towers which look quite ridiculous on such a small construction, but it is wonderfully eccentric. You will pass Cliff Pool Nature Reserve and Middleton Lakes Nature Reserve on the right and there is also a childrens farm at Broomey Croft near Kingsbury Swivel bridge. At Bodymoor Heath is a lovely pub- the Dog & Doublet by Cheatles Farm bridge. To the left is Kingsbury Water Park, a 600 acre landscaped park containing 30 lakes from old gravel pits. There are walks, nature trails, fishing, horse riding, sailing and wind surfing and power boating. It is 3 hours to here so moor for the night. Its a long trip today with 36 locks to tackle, and 9.5 hours of cruising, so have a large early breakafast! At the village of Curdworth there is a pub to the south of Curdworth bridge, and another in the village. The Minworth Locks are soon reached & there is a handy transport cafe near Hansons bridge. There are also pubs – the Hare & Hounds by Minworth Green bridge, and The Boat by Caters bridge. All shops are readily available alongside the canal around Salford, a good access point is where the A452 crosses the canal at Tyburn bridge. Star City is just before Salford Junction to your left. Star City is one of the UK's largest leisure destinations - a unique family entertainment destination with 12 restaurants and 11 leisure attractions including a 25 screen VUE cinema. Funfairs, fireworks displays and other exciting family orientated events regularly take place at StarCity, including high-profile attractions such as the Moscow State Circus and Cirque De Soleil. It is also home to England’s largest Indoor Adventure Golf Complex, a 22 lane ten pin bowling alley, a purpose built all-weather 5-a-side football center, a Laser Station and a Twin Peaks Family Climbing Centre. Soon there are 2 canals away to your left, take the 2nd turning to Cambrian Wharf, taking you through the flight of 11 locks at Aston to Aston Junction. Turn right here through the Farmer's Bridge flight of 13 locks where you will need the BW anti vandal key. Moor up in Cambrian Wharf, or turn left at Deep Cuttings Junction and moor up in Gas Street Basin, or turn right at the junctions and moor up in one of the loops which turn off the main canal. Gas Street Basin & Brindley place is in the heart of Birmingham's canal network, and has been redeveloped into a unique experience where traditional narrow boats moor up next to cosmopolitan cafes and bars. The surrounding area is a vibrant arts & entertainment area and there are many shopping options within a short walk. Moor up next to the Sea Life centre. On your doorstep will be every type of cuisine you can think of, from Caribbean to Nepalese, from Thai to Italian. Also clubs and bars, Theatres, Comedy and live entertainment and Cinemas. 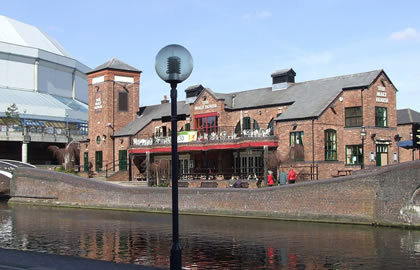 Amongst some of the attractions are the National Sea Life Centre & the Jewellery Quarter Discovery centre, also many fine Art galleries and over 500 restaurants offering every choice of food! The jewellery quarter dates back over 250 years, and is still home to over 400 jewellery businesses. It is a designated conservation area with only 200 listed buildings, and has been described by English heritage as a unique historic environment in England. For shopping a visit to the new Bullring is a must, which covers an area the size of 26 football pitches and a has a huge range of shops. Close by is the national Indoor Arena, one of the busiest large scale indoor sporting & entertainment venues in Europe. Its is 12.5 hours back to Glascote Basin, so 2 days cruising , or spend a morning in Birmingham, and set off later and spend a long day tomorrow cruising, or perhaps get up early on the last day before you have to return the boat to the marina, but make sure you get back on time!